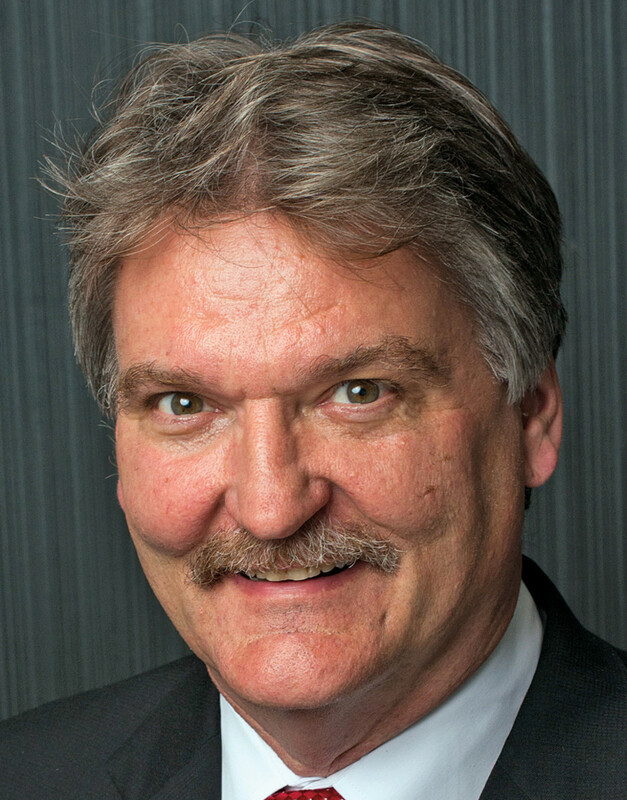 As the National Marine Manufacturers Association’s senior vice president of government relations, John McKnight has been a mediator between the boating industry and federal regulators for 22 years. 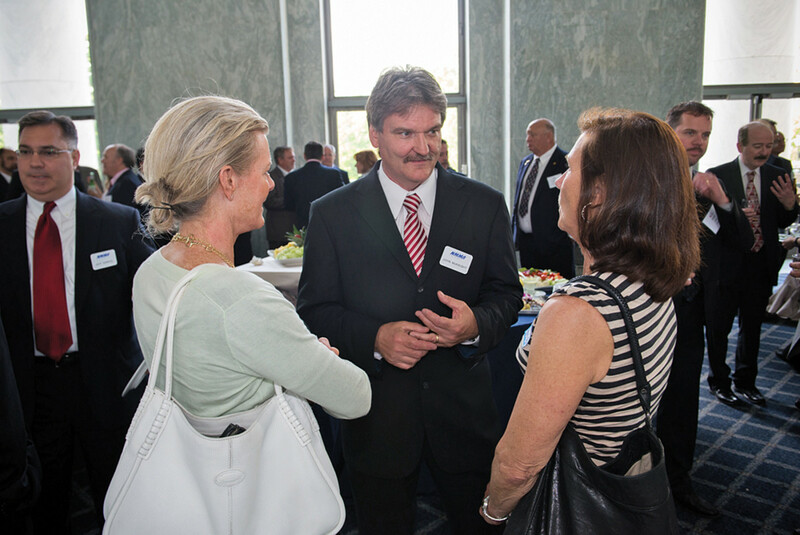 McKnight greets some of the guests at an industry reception on Capitol Hill. The NMMA hired McKnight in January 1994 to work on the new engine emission regulations that moved the outboard engine industry away from carbureted 2-strokes to 4-stroke and new-technology 2-stroke engines, as well as the MACT [Maximum Achievable Control Technology] standards. “They were the first regulations for our industry,” says McKnight, who has two grown children with his wife of 29 years, Dawn. Since then, he has been dealing extensively with the Environmental Protection Agency and the Occupational Safety and Health Administration. Before joining NMMA, McKnight, 57, worked for Witco Chemical in New York City, overseeing environmental compliance for 16 plants in the Northeast and Canada. The company was moving from New York to Connecticut, which didn’t appeal to McKnight, so he began job hunting. That was around the time NMMA was looking for someone who had experience working on environmental compliance issues, as well as experience in dealing with government agencies. The job was in Washington, D.C., which McKnight preferred over Connecticut. Since then, he has helped the industry work on numerous rules and regulations regarding boat and engine manufacturing. We caught up to McKnight, who resides in Crofton, Md., to learn more about his job and the regulatory issues facing the industry today. Q: Can you tell us about this new issue that boatbuilders should be concerned about? I know it dates back somehow to the MACT standards of the 1990s. A: Back in the ’90s, we worked on the MACT standards. It was the biggest thing boatbuilders had ever seen. It was the first regulation having to do with the materials they used, the application equipment they used. Everything that had to do with the emissions of air pollutants and chemicals had to be either reduced greatly or eliminated. So you can imagine that this was a major undertaking. In 2001 the MACT standards were finalized by EPA and boatbuilders had to change over all their processes and materials. There was another provision within the Clean Air Act of 1990 called residual risk. What Congress said was that eight years after [MACT] was implemented, the EPA had to go back and look at what you did and say, is there any additional risk out there? In other words, do you know more about the chemical [styrene] now? This called for a review to see if there was anything that was missed in the MACT. Is there new technology or was there technology they just didn’t look at? Then they need to do what’s called modeling to see if the risk from boat plants today is greater than it was in 2001. To do that, they model the emissions coming out of the plant, in this case styrene, and as it falls on the neighborhood around the plant, there are models they use to determine the risk on the neighborhood. All this is done mathematically. There are various models, and we’ll fight with the EPA over which model they’ll use over the next five years as we work on this residual risk regulation. The EPA never did anything at the eight-year mark, which would have been 2009, and they still haven’t done anything in 2016 as far as looking at this regulation, which they were required to do under the Clean Air Act Amendment. So in 2015 a group called EarthJustice sent a notice of intent to sue, saying the EPA needed to go back and look at all these industries and do a residual risk review. They’re currently negotiating the schedule to do the reviews. As a result, they’ve sent forms out to nine boatbuilder companies and are asking for an enormous amount of information. I don’t want to list the companies, but they’re focused on nine companies that have multiple plants and are requiring them to fill out this information collection request. They’re asking questions about what kind of materials they’re using, what types of application equipment they’re using, whether they’re doing closed-molding, and what the styrene emissions from the plant per year are. After they negotiate a schedule for when to implement this, and it’s approved by a judge, then they’re going to have to start looking at the different elements of the residual risk requirement. So I’m having the EPA do a presentation via phone on this at IBEX because I think it will be really helpful to get as many boatbuilders as possible up to speed. We’re doing a session there on Oct. 5 called “Styrene and your facility: A complicated relationship.” Then after we disconnect from that call with the EPA, we’re going to have members of the Styrene Information Research Council come in and brief the conferees on the latest research. I thought it would be interesting to tie them together. My goal is to get as many boatbuilders up to speed as possible. In any of these rule-makings, I try to bring people up to speed. And this one’s a doozy. I don’t want to throw the industry into hysteria, but at the same time it’s important for them to realize that we are targeted by EPA because of the chemicals we use and emit from plants. If I owned a boat company I’d want to know about this. I’d want to know everything about this. McKnight loves to get out on the water. 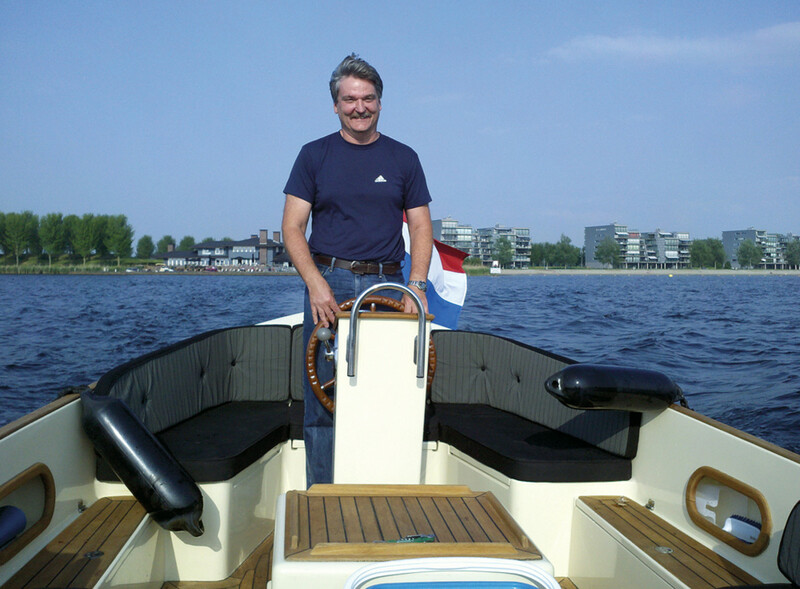 Here he pilots a sloop in Holland. Q: What are some other issues you’re dealing with on Capitol Hill these days? A: It’s kind of timely you’d ask that because I was just putting together some of the technical issues we’re working on for a presentation. As far as the legislative agenda for the rest of the year here in Washington, that’s actually pretty slow because the politicians are all concerned about getting re-elected. So not a lot of policy gets done until the next Congress comes in. But one of the things we are preparing for is to have information about the economic benefits of the industry as it relates to jobs and the economy so we can educate the new legislators and update the existing legislators. Because it will be a big turnover, as it is during any presidential election, we want to make sure we get in there right away and do our meets and greets. We’re also working to support some of those legislators who support boating and fishing issues. Today part of the office is out in Indiana with the RV Industry Association to do a plant tour with one of the congresswomen who’s running for re-election. We’ve got different activities like that going on all over the place. So that’s the legislative end of it. Of course, on the state end, legislators won’t get active until the spring. But at the same time, we’re monitoring what’s happening as far as state issues. It’s not necessarily a quiet time, but we’re not facing a multitude of bills to review. Q: I would think the election time would be a great time to tout the boating industry and the fact that it’s basically an all-American manufacturing industry. I would think that resonates with legislators seeking re-election. So you’re right. It is a really important time between now and November. And then, of course, in January when the new ones come in we [need to] get off on the right foot and develop relationships with them. Things can start moving really fast within the first two years of a new administration as they try to capitalize on their victory. Like with Obamacare. There can be a lot of activity those first two years. They take off running. Q: Will there be an increase in regulation of engine manufacturing testing facilities? A: We’re starting to see a lot of activity on the regulatory front, especially as it pertains to boatbuilders, that we haven’t seen in 16 years. I gave you a ton of information on residual risk. But that also applies to the engine test facility side. The two big ones are Mercury Marine in Fond du Lac, Wis., and Evinrude in Sturtevant, Wis. A lot of the other companies that make outboards and inboards are very small companies for the inboards, and a lot of the outboards are made outside the United States and wouldn’t be covered under this rule. 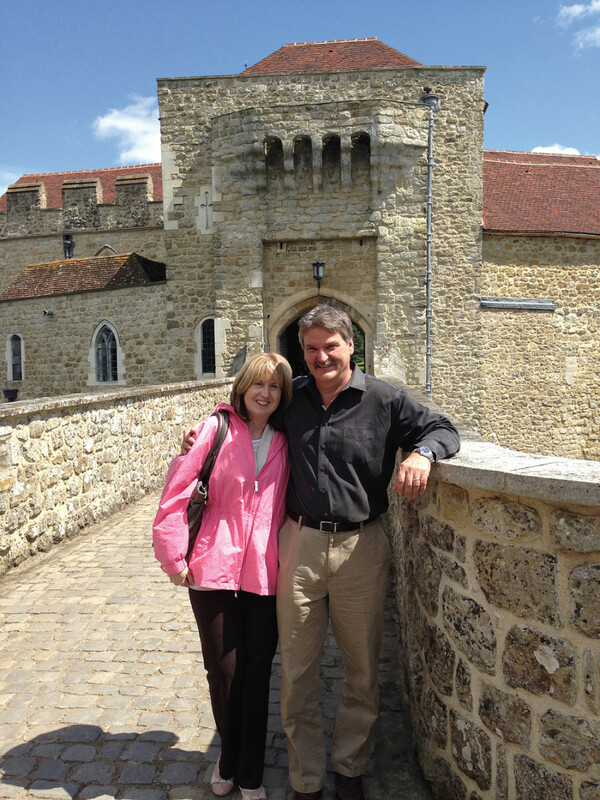 McKnight and his wife, Dawn, enjoy a vacation in England. They’re shown standing in front of Leeds Castle in Kent. Q: Is this also a result of that intent-to-sue threat by the environmental coalition? A: Correct. There were 32 industry categories cited by this environmental group and the two we got nailed on were boat manufacturing residual risk and engine test facility residual risk. So we’ll be looking at that. There are also the usual issues out there we have to be concerned about. Some of them are very technical. OSHA, the Occupational Safety and Health Administration, has come out and said they will look at worker exposure to styrene under what they call the admissible exposure limit. They’re possibly going to start collecting information from boatbuilders on that in the spring. I’ve spoken with the person over at OSHA, and he has no direction on it yet, but they have put it in their OSHA initiative on styrene called the Unified Agenda. Every year they come out with this for things they want to regulate. In it, one of the things was styrene. The contact at OSHA didn’t have a whole lot of guidance on this yet, but I told him, “Hey, if you do start working on this, it’s a big issue for boatbuilders.” It has to do with the exposure people working at boat plants can have. It’s currently at 100 parts per million. We have a voluntary agreement to do better than that at 50 parts per million. But this is saying the standard should be five times greater. That would be 20 parts per million, which is not really feasible in most boatbuilding plants. Q: Does vacuum bagging help address that? A: Vacuum bagging is a great technology, and I know a lot of boatbuilders are using it with certain parts and things like that, but it also has limited application. It’s not universal for, let’s say, small production boats. A lot of large production boatbuilders are using it because vacuum bagging gives you a good resin-to-glass ratio. You can really control that. But the most feasible technology for a lot of production boatbuilders is still non-atomized application of open molding. To start building boats with 100 percent closed-molding would not, right now, be economically feasible at all boat plants. The question is: Can you convert to this technology universally, and right now, the challenges would be pretty great. Remember, under the MACT standards back in 2001, we made so many inroads. Boat plants are so much cleaner, just like engines, than they were back in the early part of the century since going to low-styrene resins and non-atomized application. You can’t even compare the way boats were built back in the 1990s to the way they’re built today. These technologies exist and have their applications and benefits to certain production scenarios, but to say closed-molded, vacuum bagging should be universal for all applications or all parts is just not economically feasible. We have to preserve the current production methods. Q: But economic feasibility is something that OSHA and EPA consider when they’re doing these types of reviews and regulations, correct? A: Absolutely. One of the things they look at real closely is the economic cost per pound of reduction of pollution. They do a cost-benefit analysis with every rule they do. They have to publish an extensive report on the regulatory impact analysis of any rule. In that, they have to look very closely at the cost and the benefit. And the cost of converting to a technology that isn’t universally feasible. Q: And that’s a big part of what you do, isn’t it? You’re sort of the conduit between these regulatory agencies and the industry, going back and forth to balance what the needs of the agencies are versus the realities of the industry, right? A: I facilitate all these technical rules for manufacturing. So we’ll either get together as a group, the boatbuilders or the engine manufacturers, and we’ll develop a position. We’ll then work to support that position technically. Sometimes we reach out to outside consultants or attorneys to strengthen our case. For example, residual risk. That’s a modeling exercise where you take a standard plant and you model the emissions and how it would affect the environment as far as acute risk, chronic risk, environmental risk. That’s an area that’s extremely technical. There are certain people who have certain levels of expertise in that; there’s a level of expertise needed to do a permit for a boat plant, but there’s another level of expertise that the EPA refers to when they have questions on modeling, usually on the EPA’s staff. One of the things we do at NMMA quite well is put together a task force and identify the best people in the country or sometimes the world, and we will retain them to assist us so we have the best information as we approach the agency. That way we can improve working conditions and reduce emissions, but also maintain feasibility. If you look at any rules we’ve worked on, and I’ve worked on all of them since the 1990s, we’re still making boats and we’re still making engines, and we’re making them affordable. That’s the endgame — to not disrupt the industry from a manufacturing standpoint. Q: I imagine that while these can be very burdensome on industries, I am guessing the goal is not to drive them out of the country or kill them altogether. A: That’s the responsibility [of our office] to develop relationships with regulators as we work on these — to get to know each other and build a relationship. These rules are not developed in a month; they’re developed over years. We’re going to work on residual risk for years before we ever get a requirement, if there is one, to make changes. It’s going to take five years to get there because we’re going to provide more information and challenge them where they need to be challenged, and build a level of trust with them so they understand that not only are we trying to accomplish their goals, but we also have to continue to make a product that people can afford. Sometimes people in different sectors in the industry, when they first get involved in these rules, are very excited; they want to go to Congress, and say, “We have to stop this from happening!” We heard this with evaporative emissions. I always tell people: Trust me, this is going to be a long process. Continue to stay engaged, get to know the regulators. Build trust and let’s get the best people around us and let them provide us with the technical and legal information we need. At the end of the day, if we take the systematic approach and we stay engaged with the EPA, it’s just like you said, we’ll be successful. This is our government, and once they understand what we can and can’t do, then we can move forward to help them achieve their objectives while we continue to operate our business. That’s really the bottom line of what I do. It’s a lot more complicated than that and a lot more nerve-wracking than that, but that kind of sums it up. If nobody’s happy, that’s when you figure you’ve been successful. Q: Do you think there sometimes are unforeseen benefits to the regulations? A: You know, that’s an interesting question. I remember working on the outboard rule, and everyone was screaming that we have to protect the carbureted 2-stroke engine; it can’t go away, or it’s going to put us out of business. But we continued to work with the agency on a systematic approach and an eight-year phase-in to bring in new technology. I mean the old 2-stroke engines, not the new engines that Evinrude produces. But the EPA rule basically killed the sale of the old carbureted 2-stroke engines. But with that has come the growth of technology in outboards, and the consumer is loving that new technology. The question is, if it wasn’t for EPA moving forward with requiring new technology on engines and boats, would we have advanced on our own as quickly? That’s an interesting question. You could argue the consumer would have demanded the advancements, but would manufacturers have responded as quickly to that demand if they didn’t have to put the engineering dollars into it? And in doing that perhaps have found further advances to things they probably never considered? I don’t have the answer to that, but it’s an interesting question.